Lock in a great price for Crowne Plaza West Hanoi – rated 8 by recent guests! Located in West Hanoi's own business district, Crowne Plaza Hanoi is a 5-minute drive from National Museum. Offering an outdoor pool, luxurious spa and fitness center, it also houses a restaurant and cocktail lounge. Guests receive free parking privileges. Crowne Plaza West Hanoi is located just a 5-minute drive from many corporate offices, National Museum and the National Convention Center. The hotel is 18 mi, or approximately 30 minutes by car, from Noi Bai International Airport. Featuring floor-to-ceiling windows, each room is decked in modern décor. The room offers entertainment in the form of a flat-screen cable TV and an iPod dock. Tea and coffee making facilities are provided. Private bathroom is spacious and airy. It is fitted with a separate shower and generous bathtub. Massage services are available in the hotel. Its tour desk assists in sightseeing arrangements and currency exchanges. Room service is also available. Local and international cuisine can be enjoyed at the hotel’s restaurant, while drinks are served at its bar. 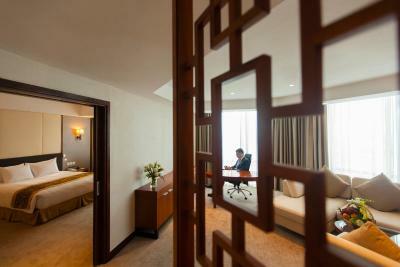 When would you like to stay at Crowne Plaza West Hanoi? Modern room comes fitted with a flat-screen cable TV, mini-bar and tea/coffee-making facilities. - All day refreshments served in Crowne Plaza Club Lounge. Complimentary tea, coffee and soft drinks available. Located on higher floors of the hotel, enjoy premier benefits with free internet and 2 pieces of laundry daily. It also includes 2 free bottles of water daily. Modern room comes with floor-to-ceiling windows, mini-bar, complimentary tea/coffee and flat-screen home cinema with iPod docking station. Bathroom includes both a bath tub and walk-in shower booth. House Rules Crowne Plaza West Hanoi takes special requests – add in the next step! Crowne Plaza West Hanoi accepts these cards and reserves the right to temporarily hold an amount prior to arrival. There were a bad smell in the room. The staff is highly professional and take care of minute details of the guests. The environment is business friendly. The bed was extremely comfortable. Great overhead rain shower. Quiet A/C. Friendly staff. Its quite far from the city proper.but its not that bad. I really like the ambiance of the hotel..its serene for me. The hotel was far from Ho Tay and the old city where most of my meetings were. Hanoi is a city packed with traffic hence staying in a hotel near these two areas was important. My room was spacious, comfortable, clean, and assured a quality quiet night's sleep. The staff was very friendly, supportive, kind, and understanding. The staff cared about me and my needs. The buffet made dining easy as it covered most eastern and western diets etc. Overall, a reliable quality place to stay.